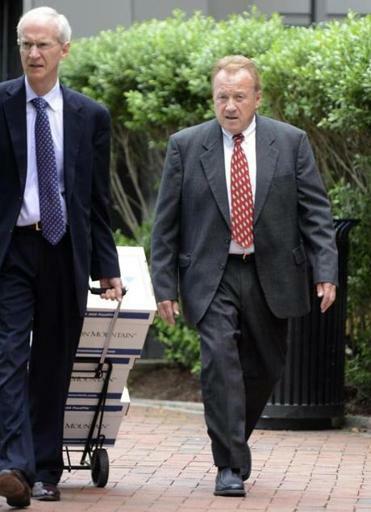 Michael E. McLaughlin (right), former head of the Chelsea Housing Authority, left federal court with his lawyer, Thomas M. Hoopes, after being sentenced. A US District Court judge sentenced Michael E. McLaughlin to three years in federal prison Wednesday, saying the former executive director of the Chelsea Housing Authority picked the pockets of public housing tenants to enrich himself and make sure he received a “supercharged” pension when he retired. In imposing the sentence, Judge Douglas P. Woodlock set aside the recommendation of prosecutors, who had sought an 18-month sentence. McLaughlin’s lawyer, Thomas M. Hoopes, asked for probation. Tenants cheered and hugged one another as they left the courthouse. McLaughlin, 67, was ordered to report to federal prison by Sept. 13. He asked to be sent to Fort Devens in Central Massachusetts because it is close to home, but the US Bureau of Prisons will have the final say. The US is challenging years of expenditures by the former head of the Chelsea Housing Authority as he prepares to face sentencing for fraud. McLaughlin pleaded guilty in February to four felonies for deliberately underreporting his income, which skyrocketed from $77,000 when he was hired in 2000 to more than $360,000 by the time he resigned in 2011. His soaring salary, along with his failure to properly report it, was first reported by the Globe in October 2011. Given a chance to speak before his sentencing, McLaughlin cited his role in transforming the Chelsea Housing Authority from a troubled agency into one recognized by federal regulators as a high performer. But he acknowledged his accomplishments would be forever overshadowed by his criminal conviction. But the judge asserted that it was “personal financial benefit,” the pursuit of a “supercharged pension,” that drove McLaughlin to inflate his income. McLaughlin, he said, had demonstrated a certain “genius” in reporting a false salary to housing regulators to avoid scrutiny while making sure to report to pension officials his actual salary, which put him in line to receive one of the highest pensions in state history, around $250,000 a year. 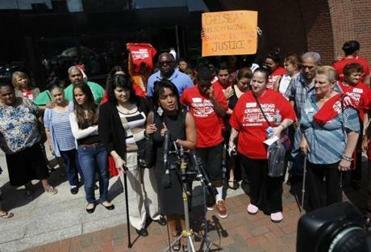 Gladys Vega, executive director of the Chelsea Collaborative, spoke outside the courthouse after the sentencing. 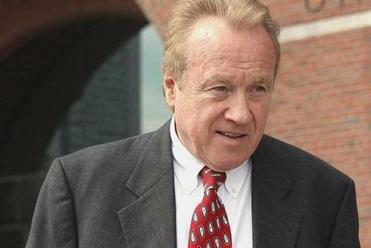 s a convicted felon, McLaughlin’s pension is in serious jeopardy. State law calls for forfeiture of pensions of those convicted of crimes relating to their official duties. The Chelsea Retirement Board has delayed action on McLaughlin’s pension application at the request of law enforcement investigators. Tenants asked Woodlock to order restitution of more than $550,000 to the Chelsea Housing Authority, money they said they deserved because tenants were forced to live in rundown, often infested apartments while McLaughlin profited. “McLaughlin took advantage of us to enrich himself by taking extra salary instead of fixing our apartments,” longtime Chelsea Housing Authority resident Mildred Valentin told the judge. But Woodlock rejected their request, saying the law does not permit it. As part of a plea deal, federal prosecutors had agreed to recommend a lighter sentence, between 12 and 18 months. But last month Woodlock made it clear he thought McLaughlin’s wrongdoing justified a longer prison term. At a June hearing, Woodlock expressed concern that prosecutors had not taken into account allegations that McLaughlin obstructed investigations into his wrongdoing or the fraud he allegedly committed by collecting more than $500,000 in salary that he failed to report to state and federal regulators. On Wednesday, former Chelsea Housing Authority accountant James McNichols detailed efforts by McLaughlin, whom he once viewed as a father figure, to cover up what he had done by instructing McNichols to destroy all of McLaughlin’s time cards in the housing authority’s files. McNichols testified that when they both learned in November 2011 that a state investigation had been launched in the wake of several Globe reports detailing McLaughlin’s alleged wrongdoing, the two men exchanged solemn pledges. “He said he would never roll on me, and I said I swore on my father’s grave that I would never roll on him,” McNichols testified. James McNichols, the authority’s former accountant, testified that McLaughlin had instructed him to destroy evidence. McNichols and McLaughlin, sitting less than 10 feet apart during the testimony, avoided making eye contact. During his tenure at the authority, McLaughlin preached a philosophy of “you don’t trust anyone who is not one of us,” McNichols said. Also testifying Wednesday was Francis Stewart, an electrician who works at the Lowell Housing Authority. Stewart testified that McLaughlin called him in 2009, asking him to donate to the campaign of then lieutenant governor Timothy P. Murray. Two years later, said Stewart, McLaughlin called him and urged him to lie about who asked for the donations if he was ever questioned by investigators. Underhill, a former authority lawyer and close friend of McLaughlin’s, was deceased by the time Stewart and McLaughlin spoke in 2011. Friends of Underhill’s said McLaughlin often put Underhill’s name on invitations to fund-raisers because he knew that as a federal employee he was barred from political fundraising. Hoopes argued that McLaughlin should not go to prison, writing in court filings that he had no criminal record and was “irreplaceable” in the care of his wife, who has Alzheimer’s-like symptoms and cannot be left alone. Woodlock acknowledged the hardship McLaughlin faces caring for his ill wife, saying, “One can’t help but be sympathetic,” but he said he was satisfied that arrangements could be made, especially in light of how often McLaughlin recently traveled outside the state, at least 85 days in 2011. 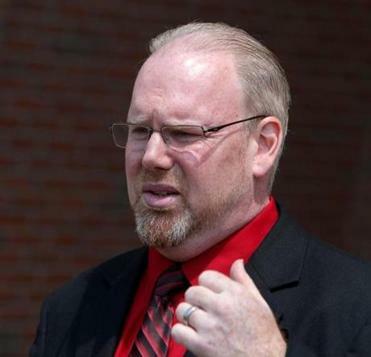 Prosecutors pointed out that McLaughlin had traveled extensively during his tenure as Chelsea housing director, leaving his wife behind in Massachusetts. The Globe has reported that he usually traveled with his close friend and deputy, Linda Thibodeau. The Globe reported Wednesday that the US Department of Housing and Urban Development is challenging the legitimacy of about $175,000 in expenditures McLaughlin and Thibodeau racked up between 2005 and November 2011, when McLaughlin was forced to resign after the true amount of his $360,000 annual salary was disclosed. raising on behalf of several politicians, including Murray. globe.com. Follow him on Twitter @spmurphyboston. Andrea Estes can be reached at estes@globe.com. Because of a photographer’s error, Gladys Vega’s affiliation was misstated in this story originally. She is the executive director of the Chelsea Collaborative.